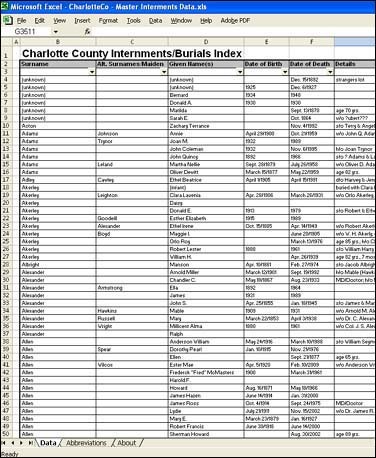 Description: Database contains a line-by-line entry for each interment/burial in Charlotte County. Vital information includes full name, date of birth & death, name of parent(s), name of spouse(s) and location of burial. Some entries may include additional data such as occupation, military service info, emigration date, etc. Status: Over 34,360 entries; completed entries for all cemeteries in of eastern Charlotte County including Deer Island; currently entering data for larger "rural" cemeteries in St. Andrews and St. Stephen. Description: Database compiled using school records (class attendance/contact records) for a timeframe of 1959 to 1984. Vital information found in this database includes name of student, data of birth of the student, name of parent(s) and the location where the student lives. No grades/markes or attendance data is included in this database. 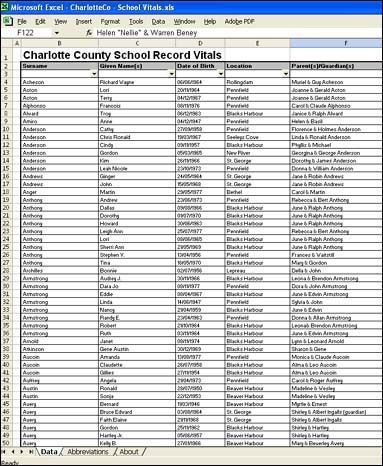 Status: 2,557 entries; database is currently only focused on schools of eastern Charlotte County which include Blacks Harbour School, Pennfield School, Beaver Harbour School, Deer Island School, Fundy High School, St. George Elementary, Eastern Charlotte Regional School. 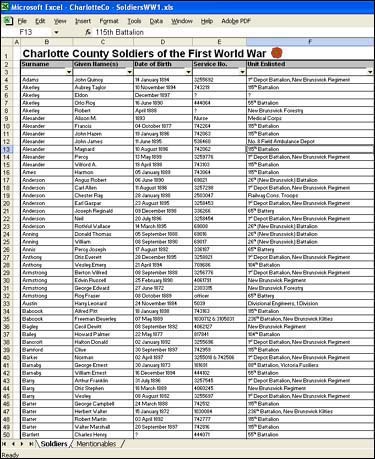 Description: Datebase contains a line-by-line entry for each known soldier of the First World War that came from Charlotte County (either born in the county or living in the county at time of enlistment). Vital information can include full name, date of birth, service number, unit/regiment served, rank, date of death and the Charlotte County parish which the soldier originates from. Description: For each of the cemeteries featured, each burial plot is given careful attention. Besides the typical vital information obtain from the headstone, most plot entries are accompanied with obituaries/death notices and other vital data such as marriage information. Besides the information on the burials of each cemetery, a historic overview and survey map is also included. Status: Over 500 pages! 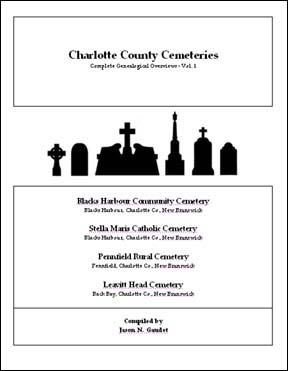 Four cemeteries are featured in this volume: Blacks Harbour Community Cemetery, Stella Maris Catholic Cemetery, Pennfield Rural Cemetery and the Leavitt Head Cemetery. 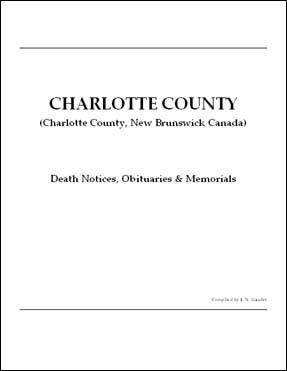 Description: A collection of obituaries from various local sources for departed citizens of Charlotte County. Though this database original comprised of obituaries starting in 2002, over half of the database now includes obituaries/death notices from previous decades.